2018 was an exciting year for the geospatial industry; Google Maps API pulling the rug from under developers’ feet notwithstanding. The power of crowdsourced location data came to fore when Snap Map became the unofficial source of on-ground reporting during the Marjory Stoneman Douglas High School shooting in the US. Artificial intelligence programs extracted road networks from aerial imagery (with astonishing success rates) and helped local taxi operators to outshine the Ubers of the world. Google and Mapbox focused on location-based gamification, while HERE chased indoor mapping by acquiring Micello and partnering with Jibestream. Recalling some of the many developments from geospatial industry in 2018 made us wonder: What should we expect this year? We turned to the insiders for answers! Go ahead, get that second beer. Call your Mom. You have time. This holiday season, location intelligence and indoor mapping technology is a traveler’s best friend. Now, simply by opening up your airline app, you’ll be able to see in digital reality, exactly how many minutes your security line wait is, how long the wait is at Starbucks and where the nearest airport lounge is. This is just one use case. The opportunity for wayfinding and location intelligence technology is huge. Airports are some of the busiest and least technologically savvy places in the world. While some airports, including George Bush Intercontinental Airport (IAH) and William P. Hobby Airport (Houston), have made major strides in wayfinding technology, the majority of airports are behind the curve. They pose a perfect opportunity for location intelligence technology – a market expected to reach 25.25 billion by 2025. Indoor location is difficult for a few obvious reasons. There’s no GPS, and construction and other updates means things constantly change. The first step is to build a “map” with vector data and a database of key assets and areas of the building. Next, a precise indoor positioning solution is deployed. LocusLabs, with help from other technology providers, delivers this as a software platform to airports and other smart spaces worldwide, allowing passengers and staff to optimize their time from curb to gate. A combination of scalable reality capture and artifical intelligence technologies are used. Below are some ways that smart buildings will change our lives. Of course, the decision to employ new technology falls into the hands of one of the busiest executives in the C-suite: the CIO. Between monitoring hardware, software, employees, and new vendors, CIO’s have a lot on their plate. Creating “smart” buildings in the enterprise offers significant benefits, including intelligence, marketing opportunities, and improved visitor efficiency. Here are are a few ideas for the busy CIO or IT decision maker, on how to start creating smart spaces, using airports as a case study. For the airline industry in particular, if you’ve traveled lately, you may notice that airports can only expand so much–and some can’t at all. While physical space is dwindling, there is still a way to maximize efficiencies, by expanding the location intelligence of these buildings. Imagine if the security checkpoint waiting time could be crowdsourced and predictive analytics applied so passengers know in real time, how long they would have to wait even during seeminly unpredictable holiday periods. Imagine if travelers knew ahead of time exactly how long it is going to take them to reach their transfer gate during a layover and could be presented with relevant recommendations along their way. Imagine that regardless of where an air traveler was in the airport, there was a unified wayfinding system would present a contextual view across every mobile app, digital sign, website, and interactive kiosk tailored to that passenger’s itinerary. Imagine, giving gate agents a real-time view of exactly where a passenger is and when she will arrive at the gate, empowering him to either hold the flight or rebook and give the seat to a waiting standby passenger. In the same way outdoor maps and GPS enable an outstanding user experience for companies like Uber and drive incredible efficiency in logistics for businesses like FedEx, airports need a similar platform that’s equally as easy that serves real time information, to alleviate some of the most common pain points. According to Airlines for America, 28.5 million people were expected to travel during the week of Thanksgiving alone last year. That’s 28.5 million people standing in line during security, looking for something to do at the gate, waiting yet again at luggage claim, and killing time while waiting for a shuttle or Lyft ride. 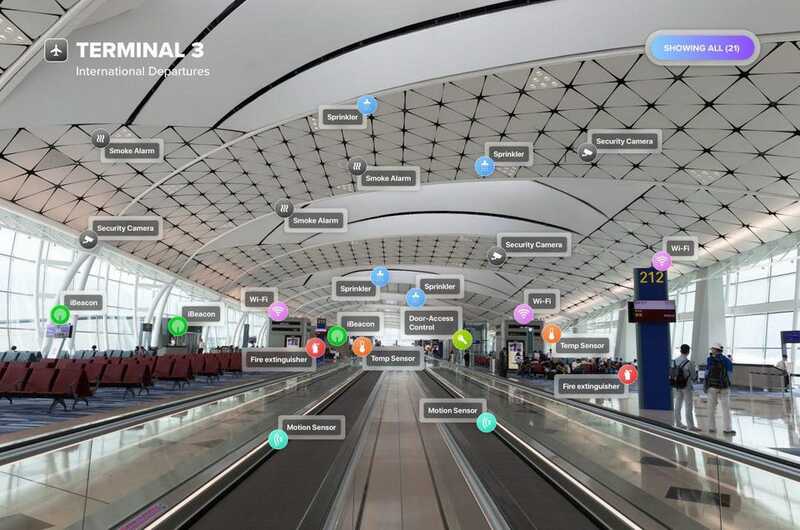 As a marketing opportunity, maps and local search in an airport are huge, and can act as a vehicle to drive awareness of what the airport has to offer and present hyper-relevant recommendations to millions of passengers who will spend money if it means making the the most of their time. Imagine if travellers could explore how to spend their time when they get through TSA. If passengers knew EXACTLY when to head to their gate based on their current location, it would mean more time at the magazine shop, food stand, or bar. The opportunity for retailers and concessions is ten-fold: retailers and concessions can present photos and marketing material within apps used by millions of travelers. This is an even larger audience than is reached by airport outdoor advertisers such as Clear Channel and JCDecaux. When you are walking through the airport, look around. Do you see more people looking up at billboards or at their phones? The opportunity for airlines is exponential, with the ability to promote their lounges and clubs by highlighting specific amenities and showing the layout on the map. Happier, less stressed travelers spend more, which benefits the airports, creating a win-win. While airports are an obvious use case for smart building technology now and one we are beginning to learn a lot from, in the near future, every CIO will be tasked with designing smart buildings. According to Dresner Advisory Services’ 2018 Location Intelligence Market Study, 66 percent of enterprises rank location intelligence as either critical or very important to ongoing revenue growth strategies, and it’s no wonder why. If you’ve worked in a modern office or campus, you know what a struggle it can be to find a conference room during a specific time window, or where a coworker sits, or an available hotdesk. This technology can automatically suggest the most convenient space to meet based on location of each participant, and show which areas are used the least, informing business owners how to save on energy costs. While casinos are filled with cameras to prevent fraud, many still lack accurate location-based data to inform the owners of the highest traffic areas, or analytics that show where and when quiet times occur. Location-based intelligence could generate personalized itineraries for a guest’s stay, increasing the likelihood that they’ll return. Holiday shoppers could have a personalized path to the product search results in any retail mall they enter, instead of wasting time wandering around hoping they come across something they like and possibly getting so frustrated that they leave. Sports fans could maximize their time spent at a baseball game entering and leaving as well as looking for their favorite beverage or snack. Every commercial building out there could have a web address, in addition to a physical address, which pulls up a digital building directory giving visitors, staff, contractors, and emergency responders a view containing everything they need to know about that physical space. The opportunities are endless. Looking ahead at 2019, airlines and airports will continue to invest in smart building technologies to continually improve the passenger experience, increase revenue, and drive operational efficiency. This is driving expectations in other sectors, and CIOs should start considering how digital building initiatives can impact their business. The Homeland Security Department is investing in technology that helps air travelers navigate airport security and gives federal agents a direct line of communication with passengers. The agency’s Science and Technology Directorate awarded a nearly $120,000 contract to LocusLabs to adapt their airport navigation application for Transportation Security Administration and U.S. Customs and Border Protection. The smartphone app would give passengers real-time location information and guide them from curb to gate using Google Maps-style directions. It would also let agencies immediately get in touch with everyone at the airport. “This platform becomes a basis for a whole segment of smart building applications, like visitor wayfinding, asset tracking [and] staff dispatch,” said LocusLabs CEO and co-founder Campbell Kennedy told Nextgov. Instead of relying on physical signs and personnel to direct passengers, CBP and TSA can use the app to communicate through maps and personalized push notifications, he said. The system would also help manage the flow of traffic through each segment of the airport. Wait times at security and customs checkpoints are notoriously inconsistent, so planning for air travel requires a decent amount of guesswork, Kennedy said. But by analyzing GPS information and data feeds from Homeland Security, the app can calculate accurate wait times and point travelers to the fastest lanes to prevent them from clogging certain areas, he said. The tool will also provide handicap-accessible routes and details on airport restaurants and shops, said Kennedy. And if it looks like you might miss your flight, it’ll even let you know to pick up the pace, he added. The award came through the Homeland Security’s Silicon Valley Innovation Program, an in-house startup incubator that invests in technologies with national security applications. Kennedy said the company will spend roughly six months building a working prototype with CBP and TSA, and then launch a pilot program at Seattle-Tacoma International Airport. Separately, LocusLabs is also piloting an augmented reality navigation tool at Dallas-Fort Worth International Airport and London’s Heathrow Airport, according to Kennedy. By tapping into people’s smartphone cameras, the app would overlay directions and other helpful information directly their screens, he said. Virgin Australia passengers can now more easily navigate the airport thanks to the addition of interactive indoor maps and navigation to the airline’s app. Passengers can use the app to navigate select airports in Australia, New Zealand, Hong Kong and Los Angeles. The new features help passengers optimize their time. They can know how long it will take them to get through security lines and get to their gate. The new app feature comes from LocusLabs. The company says its technology delivers the most accurate and consistent indoor/outdoor location experience on the market to passengers and puts the messaging and control of the platform in the hands of the airport. LocusLabs’ technology, via the Virgin Australia app, has been deployed in more than a dozen airports throughout Australia and the APAC region. The LocusMaps platform allows Virgin Australia to focus on developing features that differentiate their digital and app experience from their competitors and give passengers the best airport experience possible. “Communicating using spatial information in an airport is critical – travelers can’t reach their departure gate on-time if they can’t find it, or buy what they need at a shop across the terminal if they don’t have time. LocusLabs technology communicates the most relevant information to passengers visiting the airport, making their experience easier by removing confusion and streamlining processes, especially in complex indoor areas like airports. Recently, LocusLabs announced it has been funded by the Department of Homeland Security (DHS) Science and Technology Directorate (S&T). LocusLabs is providing the DHS with analytics to help improve airport operations and streamline the passenger experience through the Silicon Valley Innovation Program. DHS S&T is investing in LocusLabs’ development of guidance software and valuable analytics technology for potential U.S. Customs and Border Protection (CBP) and Transportation Security Administration (TSA) applications. It also allows federal agencies to send messages to passengers in real time. The Department of Homeland Security (DHS) Science and Technology Directorate (S&T) announced Sept. 10, that LocusLabs Inc. of Oakland, California has received $119,100 to develop wayfinding technology as part of the Silicon Valley Innovation Program (SVIP). LocusLabs received their award under the Real Time, Intelligent Traveler Wayfinding for the Federal Inspection Stations and Aviation Environment (Wayfinding) solicitation which seeks solutions to enhance the customs process for Customs and Border Protection (CBP) ports of entry. The proposed solution is LocusMaps, an interactive navigation tool that would allow for bi-directional communication, meaning users can receive information from CBP on how to better navigate the customs process while airports receive information allowing them to identify and analyze bottlenecks. One clear micro-moment is in the booking phase: When someone books a flight, the opportunity presents itself to offer a hotel or rental car deal. Messaging is key here, both visually and in writing. Travelaer worked with Finnair to revamp the airline’s booking engine, empowering it to include hotel bookings and ancillary sales. “We started working with Finnair in 2016 and built upon all of our experiences working with stopovers and Icelandair for almost six years,” Slone says. You may not be surprised to hear that there has been another partnership between a lighting firm and an IT company. Such has been the surge of lighting into the IT sector that it seems that every month we see a new IT – lighting relationship forming. Many have been strategic partnerships while others are more high profile acquisitions. Just in the last few years for example; Redwood Systems was bought by CommScope; Distech Controls was acquired by Acuity Brands for $252 million; Daintree Networks was bought by GE’s Current for $77 million.More recently Sensity Systems was bought by Verizon and OSRAM acquired Digital Lumens. Partnerships meanwhile are too numerous to list in this article. Some deals are a little different however, and spark a more interesting discussion on the smartification of our lighting systems. The recent deal between LED lighting stalwart Acuity Brands and indoor mapping software specialist LocusLabs may seem typical at first glance. However, the scale and progressive nature of Acuity combined with LocusLabs transport specific market points to a continuing smart building trend – the smart airport. Airports have long been at the forefront of technology, especially security technology in this day and age. High energy prices have also driven airports to seek out strategies for greater energy efficiency through lighting and HVAC – the foundation of the smart building movement. However, few airports have brought all their connected systems together in a way that we could be confident to call a truly smart airport. The reality is that an airport is a very different prospect to other smart buildings, and it is likely for this reason that deployment of integrated smart systems have been relatively slow. In many ways an airport is more like a city than a building, with a broad variety of activities and a nature fairly independent of its surrounding environment. Click here for the full publication of Passenger Terminal Today.